Tunis Campbell, though not widely known, was often reputed as the “most influential’ African American politician in 19th Georgia. He was an accomplished statesman, resourceful political power broker and an energetic proponent of human rights, in the wake of America’s “Civil War” (a.k.a., “War of Secession,” 1861-1865). This ‘freedom fighter’s’ most lasting footprints– and profound blows against slavery and racial injustice– were left in the white sands and tidal marshes of Georgia’s former Sea Island plantations, during those complex years of America’s tangling with itself, as well as its own moral and ethical dilemmas. Born in New Jersey on April 1, 1812, it was felt that Campbell’s experience as the lone black student, during his primary and secondary education years, at an Episcopal school in New York, likely strengthened his self-image as an “equal” to whites. But, this was during the time when the antebellum status quo, the law of the land and the systemic concept of white-skin privilege effectually rejected most notions of extending fair shakes to black citizens. 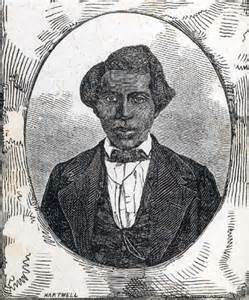 Historical archives suggest that, at age 18, his early training for missionary work seemed a shoo-in for a career within the American Colonization Society’s (ACS) evangelistic outreach work, transporting free-born African Americans to the African colony of Liberia. However, the ACS’s mixed-messaging attempts to satisfy the varied motives of its diverse membership– which included abolitionists and slave owners alike– may have inspired Campbell’s opposition to ACS policies. Some ACS members were friends and strategic partners of free blacks (then, referred to as “Negroes”) and demonstrated concern for their welfare. Others reasoned that colonization would gradually bring about the end of slavery. Yet, during this period, circa 1830, with armed slave rebellion seemingly on the upswing, many envisioned a “benefit” in keeping the institution of slavery around. This rationale nurtured the intense sentiment that free blacks were instigators of slave revolt and “promoters of mischief,” as one ACS founding-member, and slave-owning congressman (John Randolph, a planter from Virginia) labeled them. On the other hand, research reveals that another early ACS organizer and staunch advocate for the emancipation of slaves, a U.S. Senator from Kentucky (Henry Clay, Sr., a lawyer, from Virginia’s planter class), felt that because of “unconquerable prejudice resulting from their color, they never could amalgamate with the free whites of this country.” This seemed to be consistent with the perplexing viewpoints of the ACS membership, as well as a post-colonial America struggling with the racialized push-pull of its cultural and national identity. Many upstanding citizens simply felt that freedmen (former slaves) and free-born African Americans were simply incapable of understanding or integrating into America’s white society. But, Campbell remained encouraged from the rise in abolitionist and anti-slavery publications and, in 1832, founded an anti-colonization society, pledging “never to leave this country until every slave was free on American soil.” Abolitionist newspapers, such as William Lloyd Garrison’s The Liberator, argued against slavery as a social and moral evil, often citing examples of African American achievements to support their reasoning. However, proving that it was morally wrong for one person to own another was difficult, since they had to convince many whites with racist worldviews, including abolitionists, that “Negroes” were human, according to historians. Archives show that Campbell eventually converted to Methodism, and became a minister in the African Methodist Episcopal Zion Church. Inspired by its characteristic missionary spirit for helping the sick and the poor through social services, he also organized churches in the slums of Brooklyn and Jersey City. Shuttling between New Jersey and New York, he preached against slavery, colonization, alcohol, and prostitution, often against the threat of physical harm. Undaunted, he later traveled on speaking tours in the Colored Convention Movement (a forerunner of the National Association for the Advancement of Colored People – NAACP), while earning a living as a hotel steward and principal waiter in Boston and New York City. 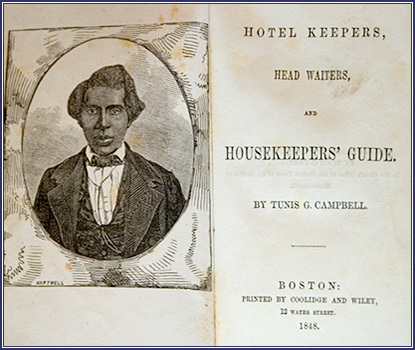 During this period, he published his highly acclaimed book (“Hotel Keepers, Head Waiters, and Housekeepers’ Guide”), married and had three kids (two biological children and one adopted child). Later, at age 51, following the issuance of the Emancipation Proclamation (January 1, 1863), Campbell was commissioned by the federal government to work in Port Royal, South Carolina, where former slaves were gathering under the protection of the U.S. military. His mission was to help resettle black refugees in South Carolina. During the Reconstruction Era (1865 – 1877), Congress set up the Freedman’s Bureau (a.k.a., Bureau of Refugees, Freedmen, and Abandoned Lands). Campbell was appointed to supervise land claims and resettlement of newly freed people on five of the Georgia Sea Islands, including St. Catherine’s Island, from where he administered his duties. Some linguistic anthropologists and historians feel that the inhabitants’ limited contact with whites was instrumental in the development of the area’s unique “Gullah/ Geechee Creole” language, called “Sea Island Creole,” and further point to the area’s Afrocentric cultural traditions as surviving the Atlantic Slave Trade’s “Middle Passage” years. In 1866, when Georgia planters received pardons from President Andrew Johnson, regaining control of these islands, Campbell shrewdly purchased 1,250 acres at Belle Ville in Georgia’s McIntosh County and established an association of black landowners there to divvy up parcels and associated profits. In 1867, as vice president of the Republican Party Campbell tried to promote laws that the Civil Rights Movement— 100 years later—was still be fighting for (i.e., equal education, voter protection, desegregated public transportation, etc.). Under the new federal guidelines, McIntosh County elected Tunis Campbell, along with 37 blacks, among 170 delegates, to the state constitutional convention. Campbell developed a voting bloc to propose and enact legislation favorable to freedmen, such as passing a bill eliminating imprisonment for debt. 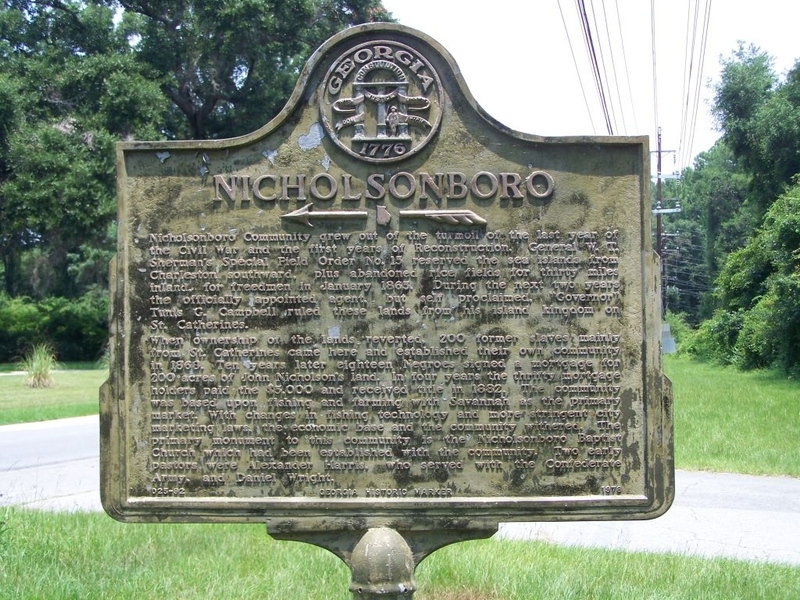 According to one historical roadside marker in Georgia’s “Lowcountry” (in Nicholsonboro, Chatham County) “self-proclaimed ‘Governor’ Tunis G. Campbell” ruled the Georgia Sea Island “kingdom” on St. Catherine’s Island, in 1868, during the time when 200 former slaves established a fishing and farming community and 18 “Negroes,” and 10 years later, signed a mortgage for 200 acres of land, paying it off in four years. As a justice of the peace, minister, and political boss, Campbell organized a black power structure in McIntosh County that protected freed people from white abuses, personal or business. 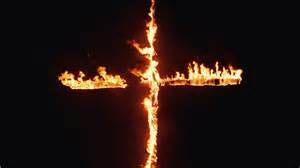 He headed a 300-strong African American militia that shielded him from reprisals by the Ku Klux Klan, within an environment where his home was burned and his family lived in constant fear. Yet, with the new constitution Campbell and two other blacks were elected to the Georgia state senate. However, on September 12, 1868, Campbell and others were expelled when antagonistic whites argued that “the right to vote did not imply the right to hold office.” They were reinstated when Congress restored military rule in Georgia, in 1869. Rounding out his term, Campbell introduced 15 bills aimed at furthering the rights of blacks. In 1871, Democrats began a concerted effort to overturn Reconstruction. Campbell’s seat was taken, and a series of lawsuits kept him in legal trouble. In 1872, amid election controversy, he lost his senate. Yet, as justice of the peace, he continued to defend the rights of black sailors on the ships docking at the nearby seaport in Darien. His work on their behalf, coupled with his willingness to imprison white ships’ captains who abused them, incurred the wrath of local whites. White planters claimed that Campbell’s opposition to contract labor and his advice to the freedmen robbed planters of hundreds of thousands of dollars. Judge Henry Tompkins, a Confederate veteran sworn to destroy Campbell, indicted Campbell for falsely imprisoning the white captains, setting bail so high that blacks were not able to redeem Campbell. In 1876, he was convicted of malfeasance in office, handcuffed, chained, and leased out for one year of hard labor to a convict labor camp, in Georgia’s brutal penal system. During one attempt at reforming the harsh prison conditions, a United States district judge examined Georgia court records in one county for one month. The review disclosed that 149 people—nearly all black–had been sentenced at ‘leased labor’ to a total of 19 years, for crimes no more serious than walking on the grass and spitting on the sidewalk. Attempts to rescue Campbell, as well as an appeal to pardon him, were unsuccessful. 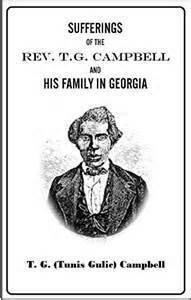 However, he was released in January 1877 and moved to Washington, D.C. where he lobbied for federal protection of free-born African American rights and detailed his hardships in another book (Sufferings of the Reverend T. G. Campbell and His Family in Georgia, 1877). Campbell died in Boston on December 4, 1891. Ira Berlin, Thavolia Glymph, Steven F. Miller, Joseph P. Reidy and Leslie S. Rowland, Freedom: Volume 3, Series 1: The Wartime Genesis of Free Labour: The Lower South: A Documentary History of Emancipation, 1861-1867/ Freedom: A Documentary History of Emancipation (Cambridge University Press; Reissue edition, July 26, 2012); John Hope Franklin, Reconstruction After the Civil War (University of Chicago press, 1961); Russell Duncan, Freedom’s Shore: Tunis Campbell and the Georgia Freedmen (University of Georgia Press, September 1, 1986); Robin Kadison Berson, Marching to a Different Drummer: Unrecognized Heroes of American History (Greenwood Press. Westport, CT., 1994).